UAE residents will have a supersonic plane flying over their homes, and they won't even realise it because it will be as loud as a regular airplane. The Boom Supersonic will be able to transport passengers from Dubai to London in only four and a half hours. The founder of Boom, Blake Scholl, said at a press conference at the Dubai Airshow that the pilot test of the plane will be carried out next year and the regular flights will come into service by mid 2020s. The supersonic plane will be 2.6 times faster than a regular aircraft and will be able to carry 55 passengers, with each seat costing the customer the same a current business-class airplane ticket. "They're not going to notice the difference because it's no louder than the airplanes that are flying today. At the airport, you're approach to land and take off speeds are a little bit faster than subsonic, which actually reduces the noise footprint because the airplane flies over you faster than it would have otherwise," Scholl told KT. 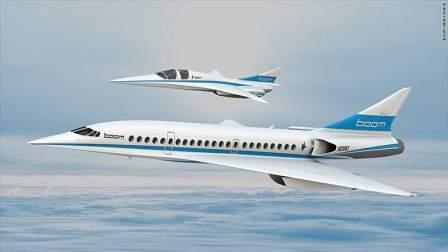 Boom will have turbo fans instead of afterburners, ultimately reducing its noise footprint. The firm is currently in the stage of its site selection process for the production of its Mach-2.2 airliner. The base of its manufacturing will be in the US, to keep it close to the engineers. The other site selections could be anywhere in the world.